Help your climbing vine or vegetable plant grow upward and become strong using the Panacea Green Coated Plant Stake. Situating a stake next to your climbing plant offers it a stable support as it matures, helping create a strong root system and thriving garden. This 48" long unit is fantastic for supporting smaller vegetable plants or flowers, and rows of nubs along the body help your plants grip the stake with ease. The dark green, plastic coating blends with the outdoors, and the metal body offers strength. The pointed end of the piece installs in soil quickly, for ease of use. Assist your plants in growing upward and create a lovely garden with this Green Coated Plant Stake. 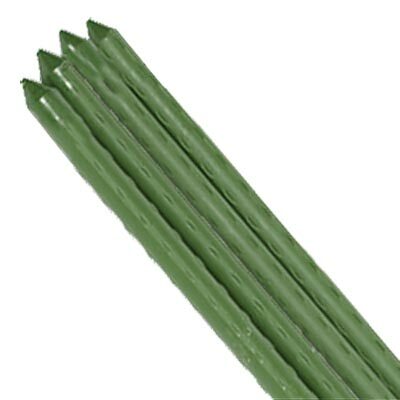 Note: This case pack includes 50 of the Panacea Coated Plant Stakes, Green, 48".